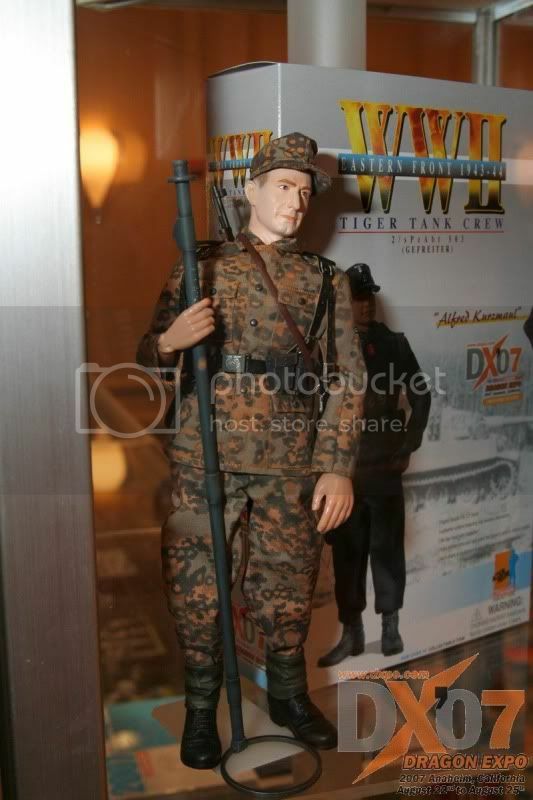 Ive noticed in quite a lot of pics taken in Normandy through to Arnhem that SS troops wearing the M44 Peadot camo tunic fail to wear shoulder boards. 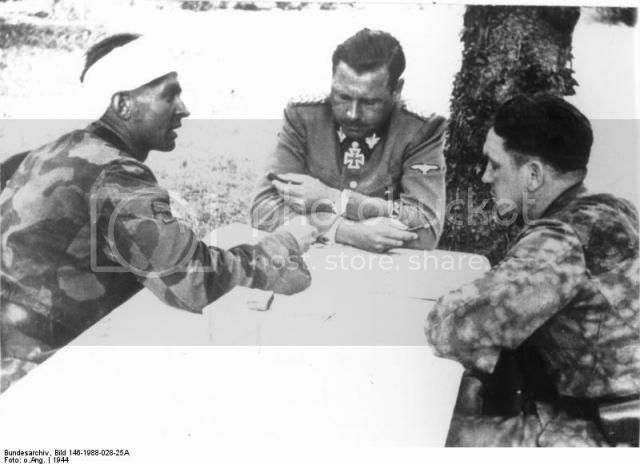 The officers wear the sleave rank insignia but no shoulder boards....even in the Osprey books the reference paintings seem to show post 1943 the practice of wearing shoulder boards with the peadot camo tunic stopped. Has anyone got any ideas why? This is a story you'll tell your grandchildren, and mightily bored they'll be! There were orders not to wear "other insignia" on the camo tunic at that time. Like other regulations, it was adhered to by many, but ignored by others. Even the sleeve insignia of rank were not worn by many lower ranks. Sometimes officers wouldn't wear insignia as well to avoid being a target for enemy snipers. Members of small to medium size unit all knew each other's rank, so it wasn't necessary to show rank like it would be in a larger group, or a rear area where there were many different people. Also, units were issued new tunics when necessary, so it was difficult under battle conditions to have the company tailor (if there was one) or other person attach all the insignia needed for all that wanted/needed them. 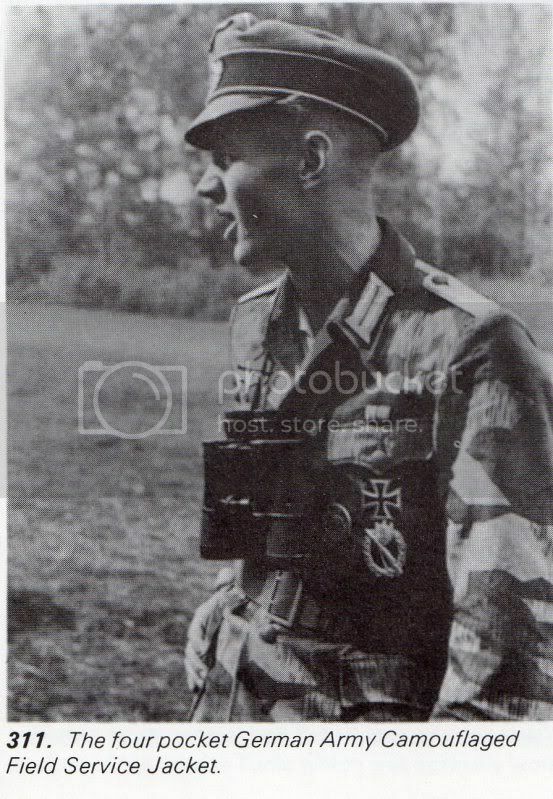 as sour said , they were ordered to wear only subdued arm rank , however many pictures exist of fully clowned up peadot tunic being worn , while not common it was done . here is an older thread from right here on the subject , its been discussed here a few times . Thanks...its an old project that suddenly got reborn after years and years on the back burner. When first made, the M43/44 uniform was factory made with sleeve eagles and shoulderboard insignia (with loops). This was the first variation. It was also done in other patterns than Dot (and you can find soldiers still wearing them up to the end of the war). The changes were due to economy of production, not camo efficacy. You can find all ranks (not just officers!!) wearing field made or field modded pea dot & other camo items. Tunics were shortened, pockets removed, collars changed, zippers added & some were even field made into actual M44 tunics (British battle dress style). Insignia was added: from cufftitles to boards to patches to full military awards. 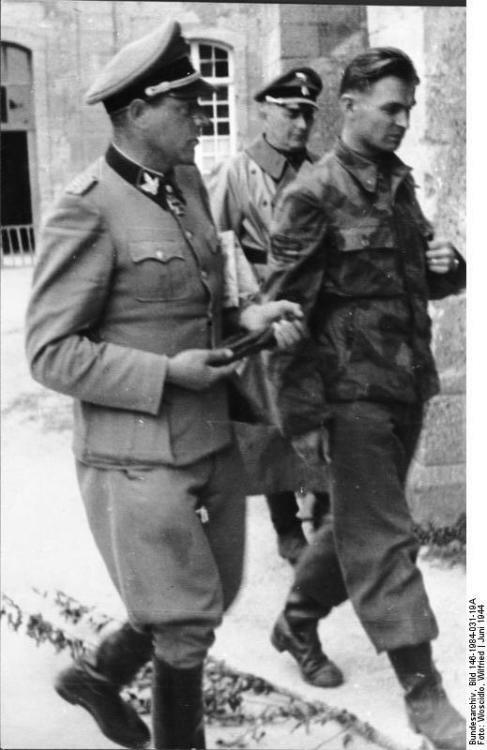 Panzergrenadiers were also issued camo wraps of dot and could have factory insignia or no insignia. A pzrg. unit could have troops wearing both wraps and m43 tunics. 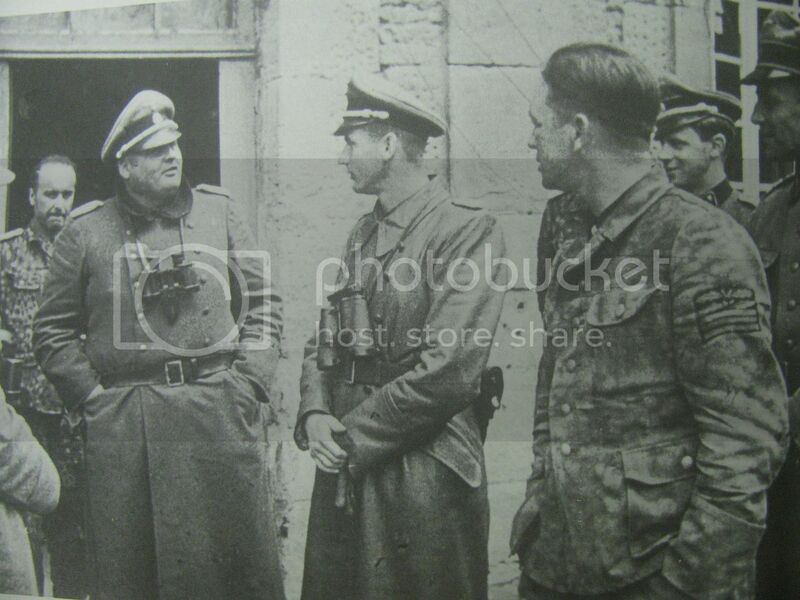 As a note, pics of the Narva Front show an amazing variety of SS camo items being worn. In short, it could be any reason why - units got what they got and troops certainly could modify an item. You'd need some really specific unit information to find out the actual why's. Correct. While Pea Dot was the most common by far, some of the M44 tunic and matching trousers were also factory produced in Oakleaf and Blurred Edge camo. 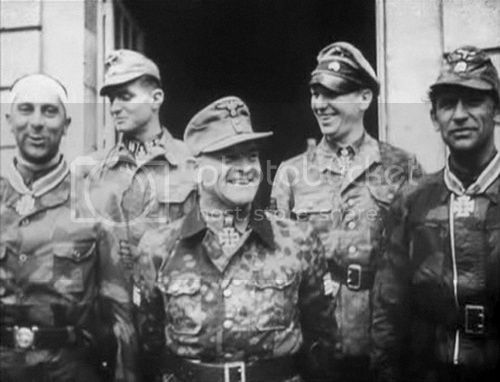 When the M44-style uniform was introduced in March 1944, the production of Waffen-SS pullover camo smocks was discontinued. As a result, the factories had large amounts of printed Oakleaf HBT material left over, and even some Blurred Edge material. (There was no Plane Tree material left at that point, as production of the Plane Tree pattern had already ceased, due to it being more time consuming than the other patterns.) Since the leftover camo HBT cloth was initially printed for use with smocks, the cloth was reversible. Therefore these M44 uniforms themselves are semi-reversible, with the majority of these early Oakleaf M44 uniforms designed to be worn primarily with the brown Autumn side out, but a few produced with the green Spring camo on the primary side. They also produced matching camo trousers. 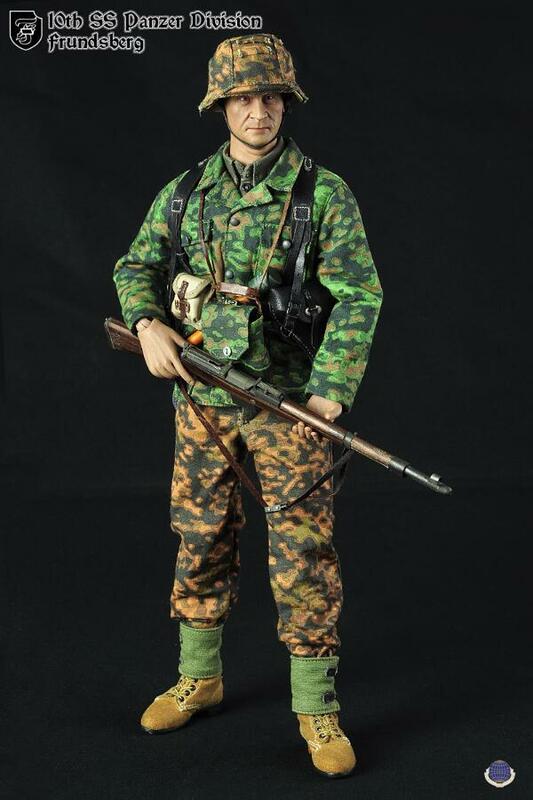 Toys City released these M44 uniform sets a couple years ago. The Italian Camo and Splinter Camo M44s are custom/field-made items, but the Oakleaf and Blurred Edge are legitimate factory-produced items. Finally, Battlegear Toys offers a variety of M44 tunics in various camo patterns, including Pea Dot and Oakleaf, as well as some other patterns like Plane Tree, Italian, and Splinter. While the M44 uniforms were not mass-produced in patterns like Plane Tree, Splinter, and Italian camo, similar style custom-made tunics in a variety of camo patterns were popular among officers. They are especially prevalent among Waffen-SS officers in Normandy. Last edited by RogueJK; 01-03-2016 at 08:50 PM. W-SS Officers liked the look of the Spring green colored side of the camo cloth, so many had full sets of Tunic/Trousers made up in that color. I guess that had the Autumn side as the semi-reversible side. Most of these privately tailored HBT and standard camo fabric suits were used as undress uniforms to give that "battle-hardened" look. Ben - great write up! Jeremy - excellent post with both WWII and hobby reference photos.